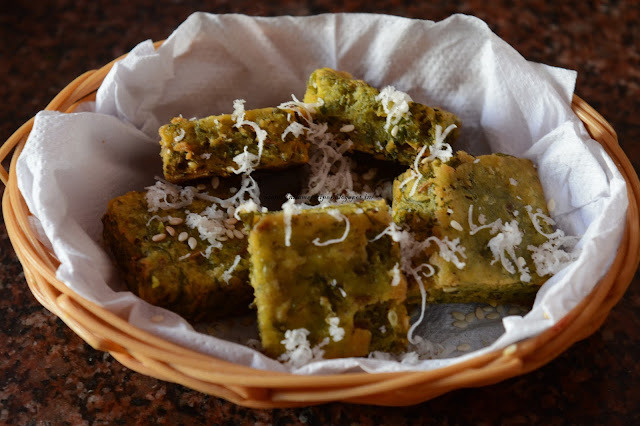 Lavang Latika or as Bengalis call it, Labongo Latika is a deep fried sweet delicacy that originally belongs to Bengal, but is also a known dish among Maharashtrians. Though famous among Bengalis during Durga Pooja and Makar Sankranti, this Lavang Latika makes its place to the top during Diwali for Maharashtrians. The name itself is enough to know that these fried treats are Lavang(Clove) flavored. This Lavang Latika is often dreaded by the homemade food lovers considering it a complicated dish to prepare but it’s a myth since this is among one of the easiest Indian sweet recipes to make. Crispy on the outside and soft of the inside, this sugar syrup coated Lavang Latika is an absolute show stealer. Although they taste best when served hot, these deep- fried yummies can be enjoyed later when stored appropriately. For the pastry, take the flour in a mixing bowl, add ghee and rub with your fingertips. Add sufficient water and knead stiff dough. Cover with cotton cloth. For the syrup, mix sugar with water and cook till one string consistency. Remove from flame and keep it warm. For stuffing, dry roast semolina and let it cool completely. Mix powdered sugar, ghee, charoli(cuddapah almond/chironji), cashew and almond powder, nutmeg and cardamom powder in semolina. Divide the dough into equal portions. Roll out each portion into puri. Place 2 tsp. stuffing mixture in the center of the puri, fold in the sides to overlap each other and seal with some water. Secure the edges with a clove on top. Heat ghee on medium flame and fry prepared latika till crisp and golden. Remove from ghee and add to sugar syrup. Leave it for a minute and serve hot. 1) For the pastry, take the flour in a mixing bowl, add ghee and rub with your fingertips. Add sufficient water and knead stiff dough. Cover with cotton cloth. 2) For the syrup, mix sugar with water and cook till one string consistency. Remove from flame and keep it warm. 3) For stuffing, dry roast semolina and let it cool completely. Mix powdered sugar, ghee, charoli(cuddapah almond/chironji), cashew and almond powder, nutmeg and cardamom powder in semolina. 4) Divide the dough into equal portions. Roll out each portion into puri. 5) Place 2 tsp. stuffing mixture in the center of the puri, fold in the sides to overlap each other and seal with some water. Secure the edges with a clove on top. 6) Heat ghee on medium flame and fry prepared latika till crisp and golden. 7) Remove from ghee and add to sugar syrup. Leave it for a minute and serve hot. 6) Nutmeg and Cardamom powder Method: For the pastry, take the flour in a mixing bowl, add ghee and rub with your fingertips. Add sufficient water and knead stiff dough. Cover with cotton cloth. 4) Divide the dough into equal portions. Roll out each portion into puri. Place 2 tsp. stuffing mixture in the center of the puri. 5) Fold in the sides to overlap each other and seal with some water. Secure the edges with a clove on top.